Seair Technologies, Inc. is proud to introduce its line of commercial hovercraft. The following page contains the Frequently Asked Questions list about our hovercraft. Some of these details are still in development, but we hope that this gives everyone a general feel for what we are building. Q: What is a Hovercraft? A: A Hovercraft is a vehicle that travels over land or water on a cushion of pressurized air. Air is forced under the hull of the craft and is contained by a tube or "skirt" of flexible material. A pocket or "plenum" of air is formed and the resulting pressure pushes the hull of the hovercraft up and away from the surface it is sitting on. Because the friction against the bottom of the craft has been greatly reduced, less energy is required to move it over the surface. This scientific principle is known as "surface effect". The air cushion also gives you smoother ride over rough surfaces. Q: How long has Seair been making hovercraft? A: Seair has been in business for over two years making ultralight aircraft, and is expanding into the hovercraft market. Although Seair does not have a long tradition of making these vehicles, our track record in ultralights (building safe fun ultralights) is carried over to the hovercraft manufacturing. Seair is currently manufacturing its first large-scale hovercraft. It will be 96' long, 48' wide, and carry 149 passengers (Coast Guard T-Boat classification). The pictures you see on this web site are from our 3-D modeling software are used in the engineering and production of this craft. You can see floor plans, sketches, and 3-D models of this craft and of the others on this website. Q: You guys haven't been making hovercraft long. In fact, your first one isn't even finished yet. Why should I purchase from you? A: Yes, we are very new in the Hovercraft market, but all our hovercraft are based on solid designs and utilize proven and existing technology. We are striving to cultivate a strong base of customers and to build our reputation the leaders in hovercraft technology. Therefore, when you buy from us you get not only a high quality product, but you get a company striving for the best customer service and support in the hovercraft industry. We never want a dissatisfied customer. Q: What is the Jones Act, and how does it affect Seair? A: The Jones Act is a maritime law, originally enacted in the 1920's to protect the U.S. shipping industry from low quality foreign made vessels. Until recently it prevented United States companies from operating foreign built hovercraft within U.S. waters. Right now, there are not a lot of hovercraft manufacturers in the U.S. and Seair is one of the few that is completely American owned. Although other commercial hovercraft manufacturers may meet the requirements of the Jones Act, Seair Technologies, Inc. is completely compliant not only to the letter but also the spirit of this law. For more information on the Jones Act and how it benefits America and our industry, refer to the Maritime Cabotage Task Force web site. This site has the best information about why the Jones Act is important, and what is being done to support this law in our courts. Having said that, Seair welcomes competition from other manufacturers, including those that have their roots overseas. We believe that competition will make all of our companies better by encouraging innovation and progress. Look at all hovercraft manufacturers and then go for a ride with us! We know you will come to Seair for your new hovercraft purchase. Q: When will you have a demonstration hovercraft available? A: Seair currently has one of our "Light Lift" series demonstrator craft available (picture to the left). This four passenger, seventeen foot hovercraft is being built for personal use and some limited commercial applications. An SH-17 or SH-21 hovercraft would be great for a water taxi service (Fleet Service) or for search and rescue operations in flooded or marshy areas. Our first "Medium Lift" demonstrator hovercraft is in production now (the 3-D model image is pictured below). We expect it to be ready in late spring or early summer 2003. This demonstration craft is slightly smaller than our normal Medium Lift line. It will be 24' long (instead of 28' long for the minimum size mid-sized craft). But, at this size we are able to easily transport this hovercraft to many locations for demonstration. We will post more pictures and information on the web site as they become available. Seair Technologies has made special arraignments with the clients purchasing the first SH-96 Heavy Lift Hovercraft. They are working with us to make these incredible hovercraft available for private demonstrations to clients in this growing segment of the commercial hovercraft industry. Q: Why don't you publish a price list for your hovercraft? 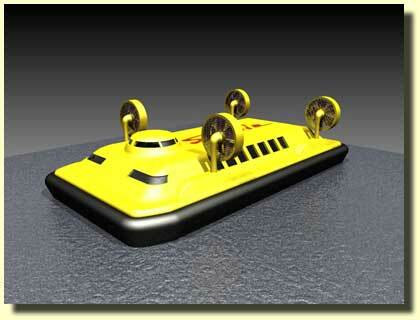 A: Seair configures each hovercraft per our customer requirements. Although the shell is common for most configurations, we manufacture and build our hovercraft using a proprietary, component-type construction that allows us to reconfigure the hovercraft depending on how a customer wants to use it. 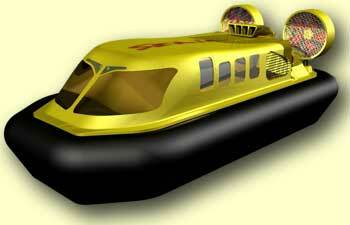 For example, a hovercraft of 60' long might be used to carry passengers, or cargo, or both. And, it may carry as few as 20 passengers (in a luxury cruiser configuration) or as many as 80 passengers (in a bus-style configuration). 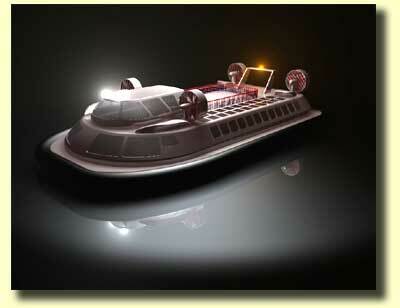 Larger hovercraft may be configured for people only, or may have an auto or cargo deck. In addition, customers may want to have additional range capability (with additional fuel tanks), or may want bathrooms, or kitchens, or some other custom interior configuration. Since it is virtually impossible to price all of these variations, we prefer to provide pricing once we have spoken to a customer and understand their exact requirements. 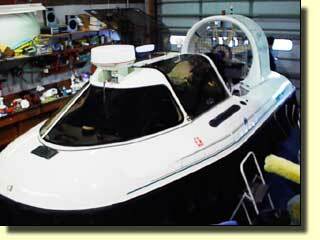 What we can say is that Seair Technologies, Inc. strives to be competitive with other manufacturers of similarly sized hovercraft. Our goal is to not let cost be the deciding factor in your decision making process. We want you to purchase Seair Hovercraft because you get the best value for your money. Because our designs and state of the art technology differs from our competition it is often difficult to do a direct cost comparison without completely understanding what we have to offer. Q: Why would I want a Hovercraft? Q: So what do people use hovercraft for? Q: What can hovercraft do? Q: What can't hovercraft do? Hovercraft do not climb hills well. They need flat surfaces... but they can go over bumbs in the surface and some rough water without rocking - no motion sickness! Hovercraft can't fly - they may 'fly' over the surfaces, but hull will never go more than about 15 feet above the surface, and the bottom of the 'skirt' will generally be less than a few inches above the surface.